Inspired by Nanodnalt's "More Trees" mod. --36 new trees/bushes and 7 new Biomes. Each tree is partial to a specific biome. --Many new trees grow fruit/nuts, have their own saplings and work with bonemeal. --Each tree and biome is optional inside the ForgottenNature.cfg file. --Includes something similar to the timber mod. Use an iron axe or better. --All blocks and saplings are available in the creative menu. --44 new leaves, 22 new logs, 36 saplings/bushlings, 2 mushrooms/giant mushrooms. --22 new planks and half planks. Made from new logs and/or any log + colored stain. --6 new stones, 4 bricks and 4 half stone blocks: Granite, Gneiss, Hornfels, Marble, Chert, Titan Stone. --8 fruit blocks. Break to drop fruit. --11 crystal blocks including a crystal 'torch'. --11 new colored fences, 11 new colored stairs, 11 new colored half planks. --10 fruit items, 5 new breads, 15 salads, 3 drinks, 4 nuts, 7 stains. --13 new tools including a saw. --Adds 18 crops including bamboo. --Crops have four stages instead of eight, yet they should fully mature at about the same time as wheat. --Craft-able bowls of fruit/veggies each have their own unique set of benefits. A forested area populated only by pink and white cherry trees. A dense tropical forest populated only by eucalyptus trees and deciduous bushes. Another dense forest, but consisting only of Angel Oaks, large Fig trees and deciduous bushes. Only red and yellow maple trees here. You'll find Sequoias, Cedars and evergreen bushes in this dense forest biome. Another fairly dense forest with plenty of fruit bearing trees and bushes. Almost every Forgotten Nature tree and bush resides within this biome. -Light and Dark blue crystal colonies. -Focus-crystals spawn underground and cause crystal colonies to spawn around them. Crafting Recipes - not updated to current version yet. --A sort-of 'how to' of the mod-- -As this mod does not currently have a wiki, this section will have to do for now. -It is a work in progress (eg. I will be adding more to this section as more questions arise). -Angel Oaks can be found in Vanilla Minecraft forests. Slightly uncommon find. -Both Crystal trees can be found in the Crystal Forest biome in addition to a giant crystal mushroom. -Sequoias, Evergreen bushes and Cedars can be commonly found in Redwood Forests and uncommonly in Taiga biomes. -Fig trees, Poplars, Acacia trees and Cypress trees can all be found in the Plains biome. -Desert Ironwood trees, desert Willows and Joshua trees can all be found in Desert biomes. -Bukkit trees, Beech trees, Jacaranda trees, Walnut trees, Apple trees, Orange Trees, Cherry trees, Peach trees, Cocoa trees, all fruit Bushes, both Eucalyptus trees, Ginkgo trees and Deciduous bushes can be commonly found in Tropical Forests and uncommonly in Vanilla Minecraft forests. -Yellow maple and Red maple trees can be found uncommonly in Taiga biomes. -Huckleberry bushes can be found in Vanilla Minecraft hill biomes. -Banana trees and Palm trees can be found on Beaches. Slightly uncommon. -WHITE Cherry trees are simply a rare version of cherry trees (1 of 10). They do NOT make cherries. -The Swamp Willow can be found fairly commonly in Swamps. -Nether Ash and Blaze trees can be found.... in the Nether >.> there's also a new mushroom there. Nether trees grow towards light. -Crystal shards drop from crystal stones and crystal leaves in the crystal forest biome. -Nitre drops from sand stone at a moderate rate and Gneiss and Horfels more commonly. -Sulfur drops from stone rarely and and Gneiss and Horfels more commonly. -New seeds drop from tall grass. -Nether mushrooms can be obtained by using bonemeal on the giant nether mushroom blocks. -If you want some netherrot or soul dust mix nether mushroom blocks with netherrack, or some soul sand with nether ash logs. -Most trees grow fruit under their leaves in the form of fruit 'blocks.' Break them to obtain the fruit. -Cherry trees, Apple trees and bushes produce fruit IN their leaves. To distinguish whether or not there is any fruit in the leaves, see if there are colored speckles on the leaves. If there are speckles, give the leaves a bit of a tap (right clicking won't work) to drop the fruit. For Apple trees, apples can be seen on the leaves when present. If not picked for long enough, they will actually drop. -All nuts grow under either Palm tree leaves, Ginkgo tree leaves or Walnut tree leaves. Break the nut blocks to harvest the nuts. Right click on the side of a 'sturdy' block (cobblestone, stone, sandstone). The rope will deploy down starting from where you placed it, straight down 'till it hits another block. It acts as a ladder. To retrieve the rope, you must break it's highest rope block. Breaking lower ones will only shorten the rope. Right clicking dirt or grass blocks will change the block into netherrack when using netherrot, and soul sand when using soul dust. If you want some netherrot or soul dust mix nether mushroom blocks with netherrack, or some soul sand with nether ash logs. As a precautionary measure, you should use a wood or stone axe when cutting down logs if there are other logs nearby that you don't want to be cut down. Lumberjack may cut down ANY logs that are touching each other when initiated. In order to initiate Lumberjack, you must use a proper axe on a log block that has NO logs underneath it or beside it, but at least one log directly above it. Lumberjack will then cut down ANY log blocks that are, in any way, connected to the block that was directly above the initial log block. If the "extraDamageToAxe" option in the configuration file is set to true, Lumberjack will deal damage to your axe equal to the number of logs that have been cut down, but the damage is capped in such a way to leave your axe with one use at least. An axe that has only one durability point left cannot initiate Lumberjack, but will break after cutting one more log as normal. The option "LumberjackPower" in the configuration file sets the maximum number of log blocks that can be cut down in a single initiation of Lumberjack. This is a configurable attribute because high numbers of items floating in the world can cause severe lag on most computers. Always back-up your .cfg file just in case. drop the mod zips into the mods folder, then restart Minecraft to load the mod. DONE. -Trees shouldn't be able to be used for greifing so easily now. -All trees no longer consume durability or bonemeal when cut or fertilized in creative mode. -Nether shroom blocks can now be crafted into their respective. -Added sky islands. Works by moving a random portion of land to the sky. Their generation is a config option. -Added item: Surface Teleporter. This teleports the player to the highest point directly above them. Craft with two ender pearls and one blaze powder. Crafting this item is also a config option. -Solved a bug where rotated vanilla logs would drop as rotated items named "oak log" no mater the original log name. -Attempted to fix the problem where the new nether mushroom blocks would cause an array index crash upon block harvest... I was unable to recreate the reported crash. -Added "false" block. Behaves like a ghost of whatever block it was placed on. -Added "one-way camouflage" block. Behaves like the "false" block with two exceptions: 1) Entities can't walk through it. 2) Once side of it can be set to be transparent by right-click with no item in hand. -Fixed Array index OOB on itemblock. -Fixed Break block event null pointer. -Fixed tools: they dig / mine as they should now. -Items dropped by new stones fixed. -Crystal stuff is now a bit translucent. -Crystal torches now behave as they should. -"Lumberjack" works for vanilla logs now. -Vanilla stone and sandstone drop a couple modded items. -Fixed titan stone pickaxe to NOT destroy chests on right click. -Changed bukkit tree branch growth slightly. 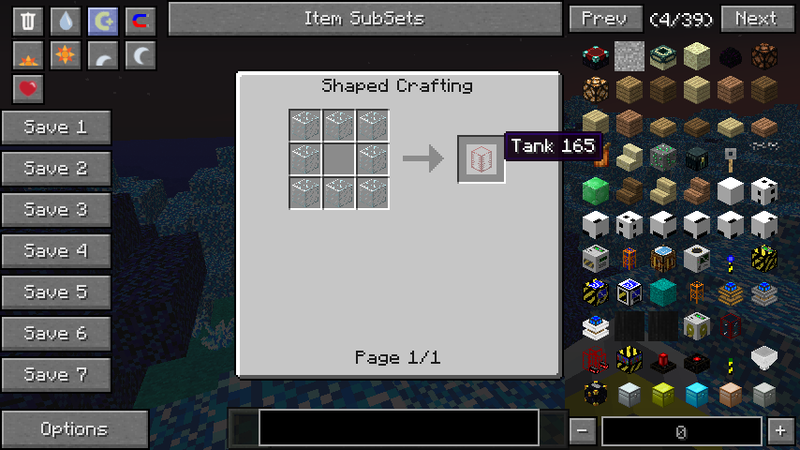 -Added various fluids and ores, but they are only accessible via creative menu when they are enabled via the config. Can be disabled of course. --Fixed over a dozen bugs. --Can craft ice with four snow blocks. --Indexed all new stair IDs together. --Lumberjack now drops all logs at the initial chopping location (huge reduction to lag when cutting down trees). --Added obsidian tools. Very low enchantablility, high durability. --Can obtain 2 flint from 4 gravel. --Can make glowstone by surrounding a gold ingot with 8 redstone. --Can make "thin carbon wafers" with two rows of string 'sandwiching' a row of coal or charcoal. A row of wafers under a stick and flint make 4 arrows, making an effective substitute for feathers. Can also be used as semi-effective coal. --Can craft 2 bones into 4 sticks. --Can craft saplings into sticks. --Can make 8 obsidian from 8 lava buckets and 1 water bucket. --Can surround flint with 8 coal to make a coal chunk. Also can be used as fuel (lasts 8x as long as coal, or able to smelt a stack of items). --Can surround obsidian with 8 coal chunks to make a compressed coal chunk. can be used as fuel (last 64x as long as coal, equivalent to smelting 8 stacks of items). --Can surround a crystal chunk with 8 compressed coal chunks to make a diamond (requires 8 stacks of coal in all). --Made maple trees less rare. --Made sequoias more rare in taiga biomes. --Flowers are a bit more rare. --Nerfed crystal tools a bit. --fixed fast/fancy graphics to work from in-game gui. --fixed sheering of new leaf blocks. --fixed height limit bug for fruit trees. --Fixed the end not generating. --Added blocks: Nether ash sapling, leaves, planks and logs, Nether Blaze sapling, leaves, planks and logs, nether mushroom and spore blocks, 7 parquet planks, granite bricks, hornfels bricks, gneiss bricks, marble bricks, and crystal bricks. --Added items: Netherrot and Soul powder. --Added reverse crystal item crafting. --Organized textures and added a texture file. --I found that some food items were .... crazy overpowered. Fixed that. -Changed config options for logs and saplings back from an index to individual settings. 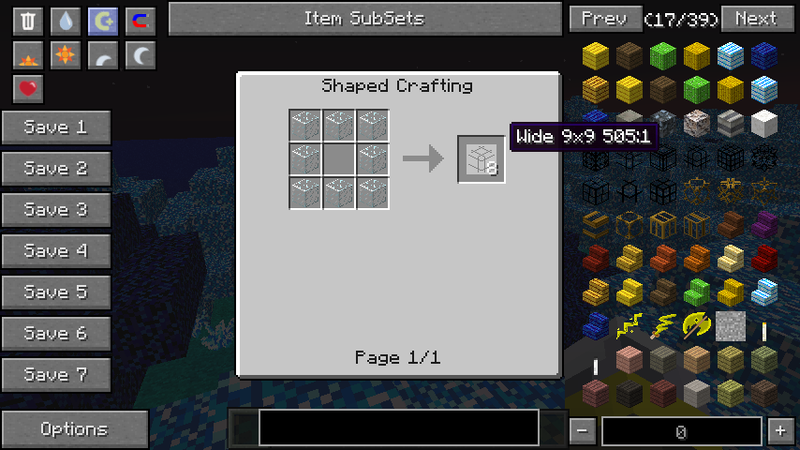 -Fixed crafting compatibility issue with buildcraft. -Fixed lumberjack dropping sideways logs when cutting down large oaks. -Fixed Stone blocks sounding like wood. -Added the option to disable gunpowder crafting and dropping. -Added options to disable any or all new stone generation. Disabling all of them also frees the block ID for the new stone. -Moved biome id options into the general category. -Added labeling for biome options, crafting options, tree and bush options. -Fixed bulbs and roots planting properly. --Fixed name issue with blueberries. --Fixed hoes that were not... hoeing. -Forge update fixed tilled land. No longer reverts to dirt if not near water when planted on. --Added sulfur and nitre. Mix with coal/charcoal to make gunpowder. --Leaf, log and sapling IDs set by an ID index for each group--1 for leaves, 1 for logs, and 1 for saplings. There are 6 leaf block IDs, 3 log IDs, and 3 sapling IDs. If, say, you set the leaf index to 200, LCTrees will set the 6 IDs to 200-205. The same pattern goes for the other indices. --Added the option to disable the generation of bamboo all together. --Added the option to set the drop rate of new seeds. Setting to zero will disable new seeds all together. --Apparently there was no way to craft colored half planks... so I fixed that. --added bamboo and dried bamboo stairs, fences and half blocks. --bamboo and dried bamboo can substitute for normal planks. --Added aesthetic stones: Chert, Granite, Gneiss, Hornfels and Marble. --Fixed saw not cutting vanilla wood quickly. >>Previous changes seen in LCTrees mod. --Do NOT post crash bugs without posting an error log; it's a waste of my time and only distracts me from making updates quicker. --When posting non-crash bugs, include details! Do not just state what the bug is. --If you have this mod installed with many other mods and your game crashes, don't bother posting it here unless you are sure which mod it is incompatible with. If you aren't sure, install the mods one at a time and load up the game for each install to see if it crashes. --Excessive amounts of trees in certain biomes can cause a lot of lag on loading. --OP needs an updated crafting recipe list / picture. --OP needs a spoiler that shows off all crops in the mod. This document is Copyright ©(2012) and is the intellectual property of the author. It may be not be reproduced under any circumstances except for personal, private use as long as it remains in its unaltered, unedited form. It may not be placed on any web site or otherwise distributed publicly without advance written permission. Use of this mod on any other website is strictly prohibited, and a violation of copyright. Exception: ScottKillen and MisterFiber have my permission to use this mod and all or any of it's source for any use as they deem fit. This error has been saved to C:\Users\Owner\AppData\Roaming\.minecraft\crash-reports\crash-2012-10-13_01.35.44-client.txt for your convenience. Please include a copy of this file if you report this crash to anyone. - OpenGL: ATI Mobility Radeon HD 4250 GL version 3.2.9751 Compatibility Profile Context, ATI Technologies Inc.
Also theres a few items I have no clue what the usage of them is such as rope, is there any wiki or anything for this or what was LCTrees? Ah, the name is a quick fix! I distinctively remember testing the hoes and seeds... they worked. --Fixed seeds and name issue. Will update tomorrow. Yes please! I love tree mods! Fruit fruit FRUIT! I added the .info file as well. Rope is bugged after updating forge versions. See Guide spoiler for details. What to do, if my id's for leafs used to be 2780;2790;2800 and so on. Now the new leaf index uses 2780-2786 and my world is broken, any way to force it to use the other id's? Re-download v1.0.2. It should be fixed for you. "leafIDIndex" is no longer used. It's awesome that you've made new blocks(especially the [dark]crystal stairs/half-slabs/fences), but I've noticed one of the glass recipes conflicts with the buildcraft tank recipe; and would only make the tank instead of the glass. Is that possible to get it so the recipes won't conflict with each other anymore, or are you going to keep it as it is? I object, having multiple videos w/o a tab on a page absolutely kills my browser. Takes near a minute to scroll down smoothly. Probably time to change my computer, but I'm pretty sure I'm not the only one feeling this way. So I thank Nightshade for graciously shoving them all in a tab. I love the new stones - except that I now have three kinds of marble. Great mod! The only thing (which causes me to downgrade to the previous mod again) is that all my smooth stone sounds like wood now!? Dunno about Cobblestone, though. Yea, the stone does sound like wood when you step on it/mine it. The cobblestone is fine though. Which glass recipe is it? I didn't bother naming the double slabs as they wouldn't normally be able to be in a player's inventory. I realize marble is a common mod addition, so I could add an option in the .cfg file to disable marble. Forge would simply change the existing marble (from my mod only) in your world into air blocks. Well, here's pics of both of the recipes for the buildcraft tank and the wide 9x9 glass that are conflicting with each other. Awesome mod btw, I love how the tall trees look in my world! I tried deleting the old files and replacing them with the 64x--looks great! See change log for details.